I have experienced every possible temperature so far this month. It was hot in Broome with magical balmy evenings, then dry heat in the red and dusty desert; cold mornings with sunny days in the Flinders Ranges; and very back home to chilly Melbourne mornings with some rain. My travels have included an exciting one-day visit to our most remote school at Punmu in the Pilbara. Ever since the The Rawa Community school applied to join our program two years ago I have been intrigued and have wanted to visit. It would be my first visit to an aboriginal community and my first visit to the Pilbara. The school is seven hours by road from Port Hedland, and one and a half hours from Broome in a very small plane. Our School & Strategic Projects Manager Jacqui Lanarus and the Learning Support Officer for Western Australia Marcelle Coakley had already been at the school for a week when I arrived together with our CEO Ange Barry. The school has more than its share of challenges and in 2011 it had to contend with significant flooding making roads impassable for considerable periods of time. About fifty students attend this school and we are thrilled to welcome them into the Stephanie Alexander Kitchen Garden program. The school has built a wood-fired pizza oven, and when I was there the students had dug a fire pit on which fresh corn and potatoes were roasted for our celebratory farewell lunch. There is plenty of artesian water and the newly planted garden was already sprouting beans, cucumbers, pumpkin, and there was a substantial crop of garlic and potatoes planted. Alongside was the beginnings of a bush tucker garden with the local elders advising on seed collection. Other students were enthusiastically planting seeds in a shade house constructed from recycled items found at the local tip. The school had two African teachers who intrigued us all by promising to show how to stew pumpkin leaves with spices without damaging or compromising the growing pumpkins. The pizza lunch was a huge success. 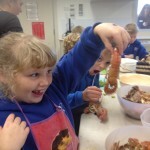 The students cut all the vegetables from fresh food trucked in from Port Hedland (this happens only once a month so one can understand the enthusiasm to get their own garden producing), they made the dough by hand, rolled and shaped it and had a great time deciding on the toppings. Everyone ate everything! There are so many exciting possibilities at Rawa. Many involve greater engagement with the community elders for art projects, or to hear the stories, or to share cook-ups. Next stop was the Flinders Ranges and a quick visit to one of our newest projects at Quorn Area School. The school already has an attractive teaching kitchen space but the garden construction was just starting. I was impressed to meet a local bobcat operator who was effortlessly moving piles of rich soil and red gum sleepers to create the raised beds for the children to plant into. For a complete contrast I visited tiny Ungarra school on the Eyre Peninsula. Total student population at the time was 32. Every child participates from the youngest to the oldest. The school is two years into the program and its garden is extensive and prolific with a gigantic strawberry patch! I toured the fabulous orchard, met the chickens, noted the worm farm and the compost heap, and then went to the kitchen. The class had had a competition to decide on the two best pizzas to make for my visit. The winners were surprising. We had parsnip, carrot and goat cheese for one, and yabbie, oyster and calamari for the other! 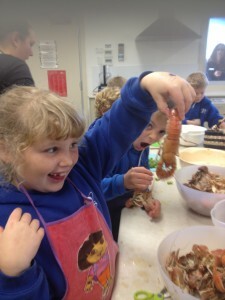 It was great to see the 6- and 7-year-olds cutting up the vegetables, and the 8- and 9-year-olds all shelling the freshly boiled yabbies, and ‘removing the poo’ as one little girl told me very seriously. And how wonderful that the students had thought of using the local speciality. Back home the growth in my garden has slowed down. The new plantings of broccoli, Tuscan kale, spinach, celeriac and a second crop of leeks are all growing but slowly. The salad barrel is still growing but the leaves are smaller than they were. And yet surprisingly the green capsicums are still ripening to red. The picture of the month has to be this enthusiastic student dealing with yabbies at Ungarra.